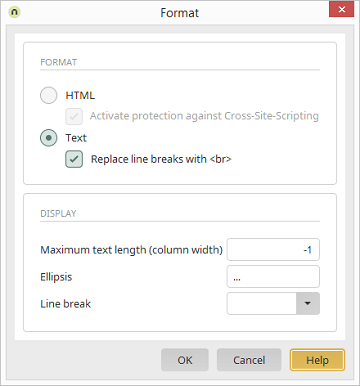 This format option will interpret the text as HTML. If this setting has been set, this will prevent information, which comes from a context where it is not trusted, being inserted into a context where it would be classified as trustworthy. By entering a whole number, the maximum text length of the view field is determined. With a value of -1, all characters will be shown. In this context, "Ellipsis" defines the character(s) that will be shown after the text, if it exceeds the maximum text length.